For years I have loved coffee, and have even taught a hand full of people how to grind and brew their own coffee, but I have never posted a how to brew guide. 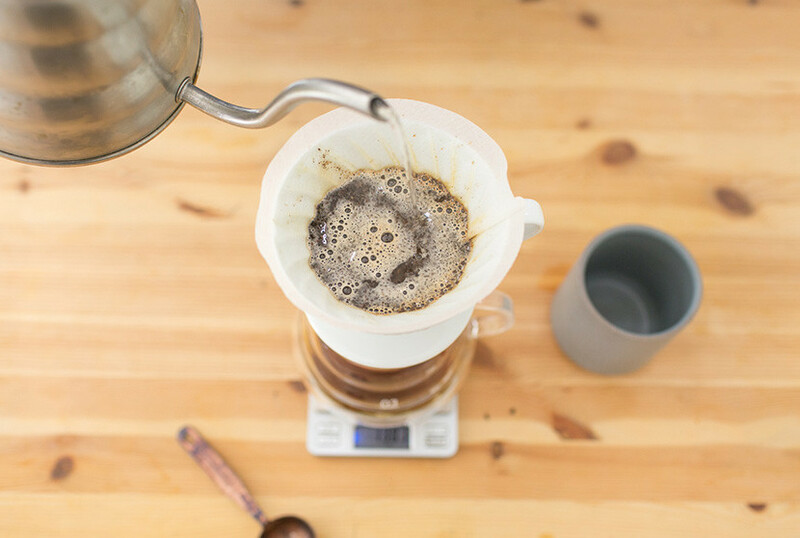 My reason being there are just so many excellent technical brewing guides online: One Village Coffee, Stumptown Coffee, Blue Bottle Coffee, Counter Culture. However, I like many of you, was a bit overwhelmed by the numerous brewing options and just ended up asking around for the best method. 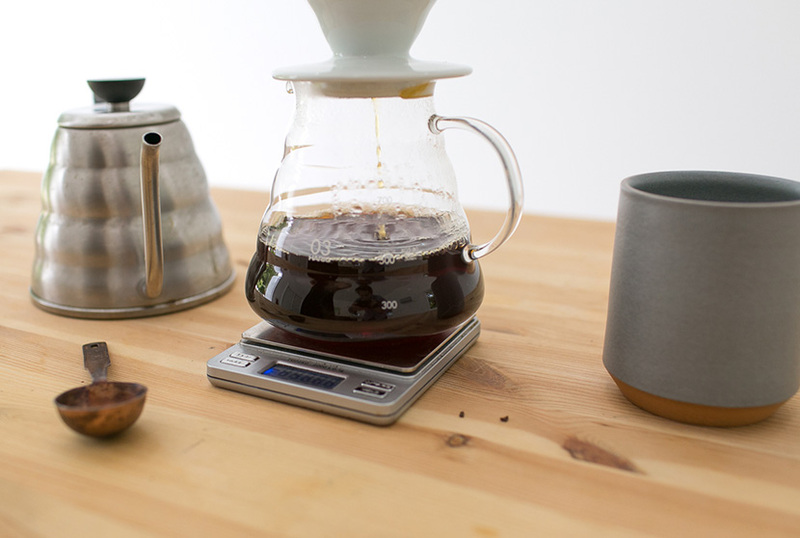 Everyone will give you a different answer, but my favorite method is the V60. 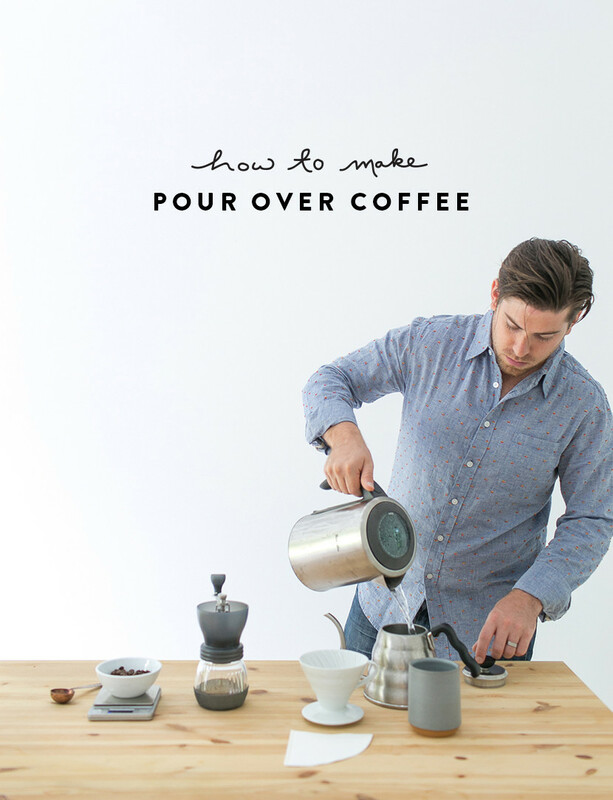 So I am going to finally go for it and just give you a quick guide to making a simple pour over cup of coffee. Before I get to far into the post, you need to you have the right tools. 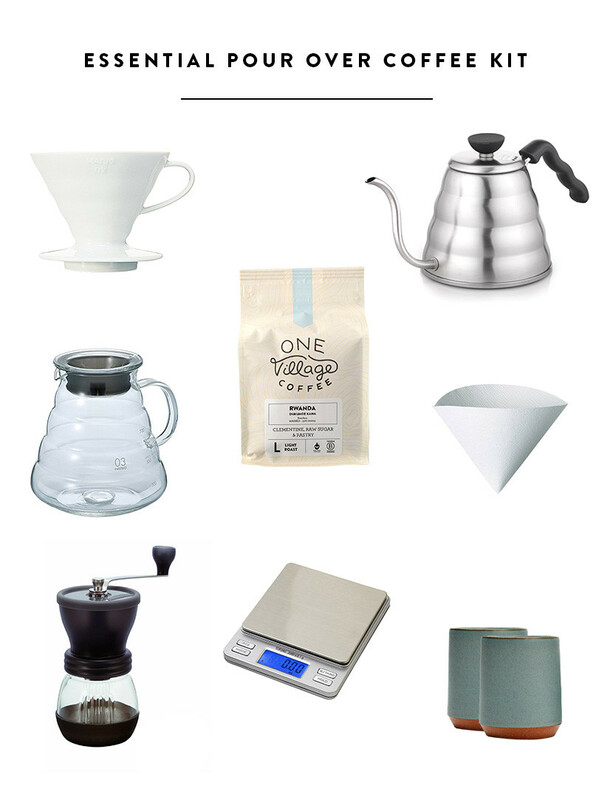 I have collected everything I use to brew my pour over coffee above. This is pretty much the cheapest way to build your brewing kit, however this is just the base. 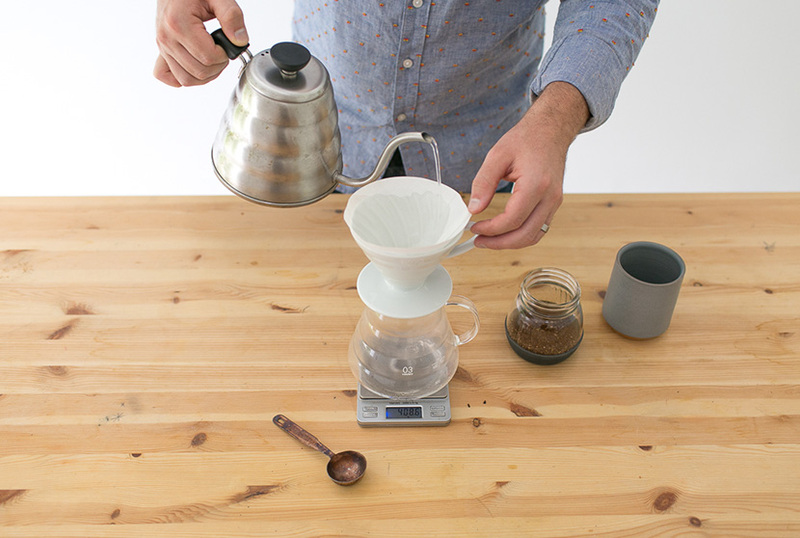 There are some really beautiful brewing kits out there. Step 1, measure out 30gm of whole coffee beans. If you are making the same amount of coffee every morning, keep track of the number of tablespoons it took to get to 30 gm. 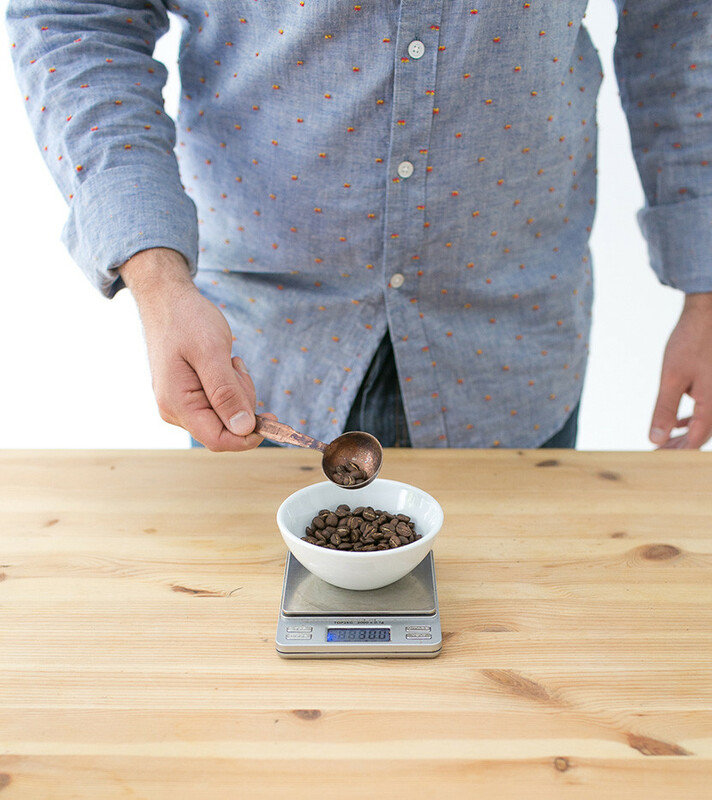 The next time you make a cup of coffee skip the scale and just scoop that many tablespoons of whole beans into your grinder. Step 2, grind your whole coffee beans. It is important to have freshly ground coffee right before brewing, so you get the most flavor and bloom as possible. Don’t worry I’ll explain the bloom in step 4. Ah right, your grinder. 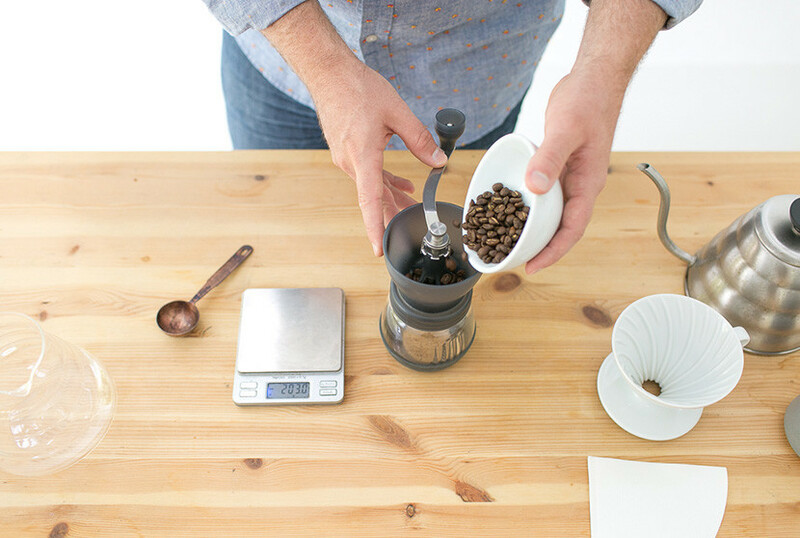 You should have your grinder set to a medium to medium-coarse grind. You want to make sure the beans aren’t too fine. 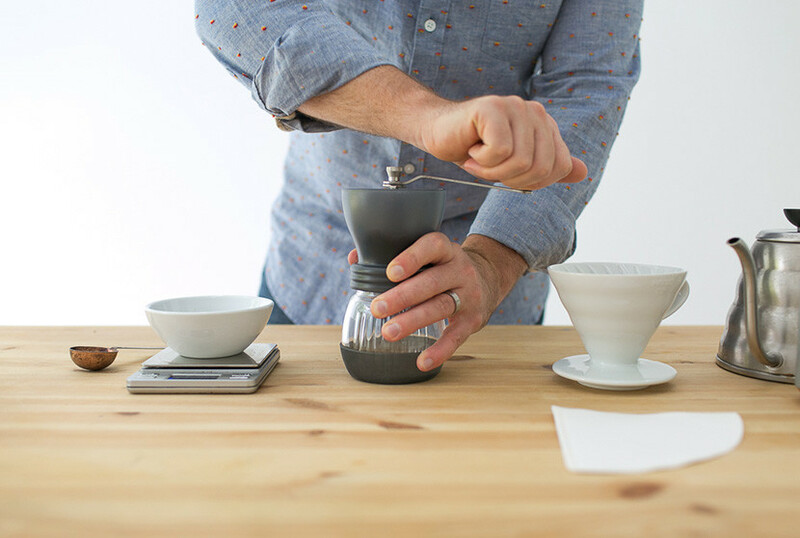 Grinders… You can use an automatic grinder, I recommend the Baratza Encore: $125, however if that is more that you want to spend I recommend the use a Hario Hand Grinder: $27.99. It is great for travel and is the cheapest quality grinder you can buy. 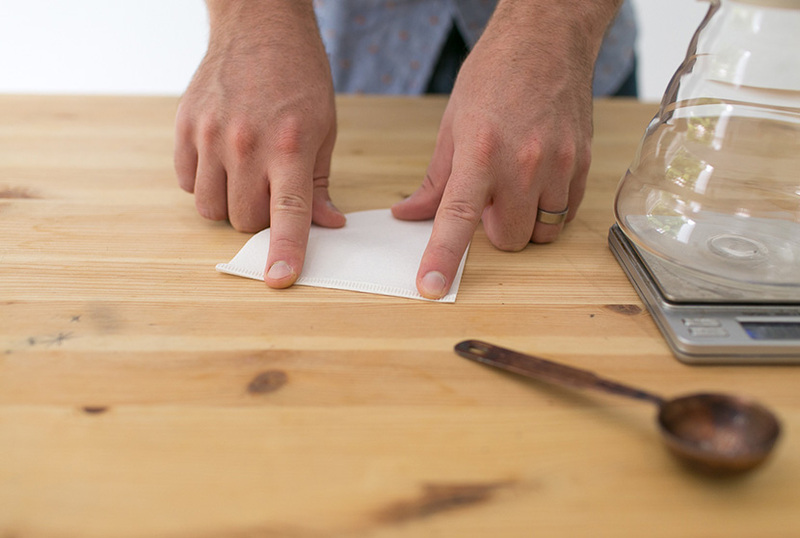 Step 3, grab a single V60 filter paper and fold the flat join over so it will lay evenly inside the V60 dripper. Step 4, Place the folded filter in the dripper and wet the filter completely. Don’t worry about the water dripping down into the carafe we will be dumping it out as soon as the filter is totally covered. Step 5, pour the 30gm of ground coffee beans into the filter. At this point, you will want to zero out your scale. Step 6, with the scale at zero, slowly add 60gm of water to the beans, it should take about 10-20 seconds. This is the bloom and it allows the beans to warm up before the full brew. 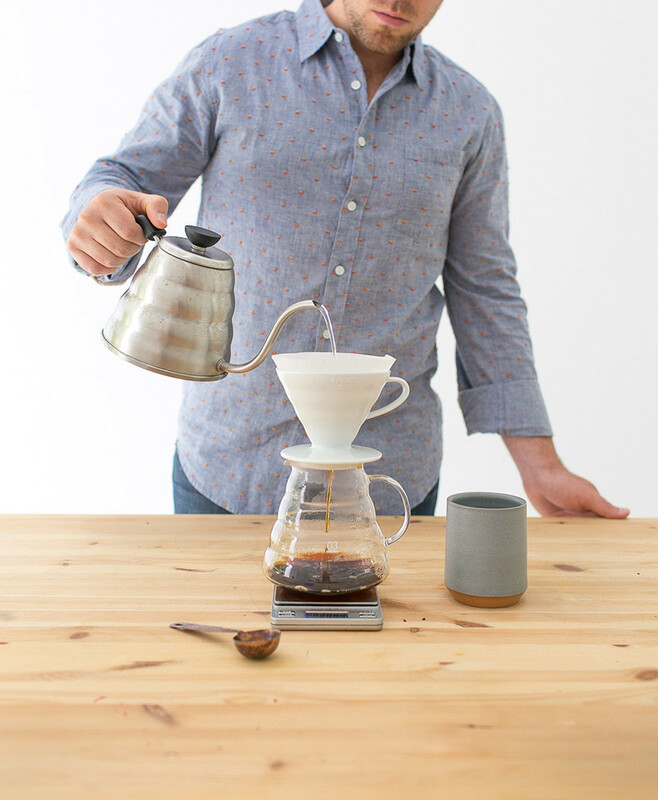 I usually wait until I cannot see water dripping into the carafe before I move on to the next step. Step 7, pour the water over the beans until the scale measures 500gm. You should still take it slow and evenly, but the timing and pour is up to you. 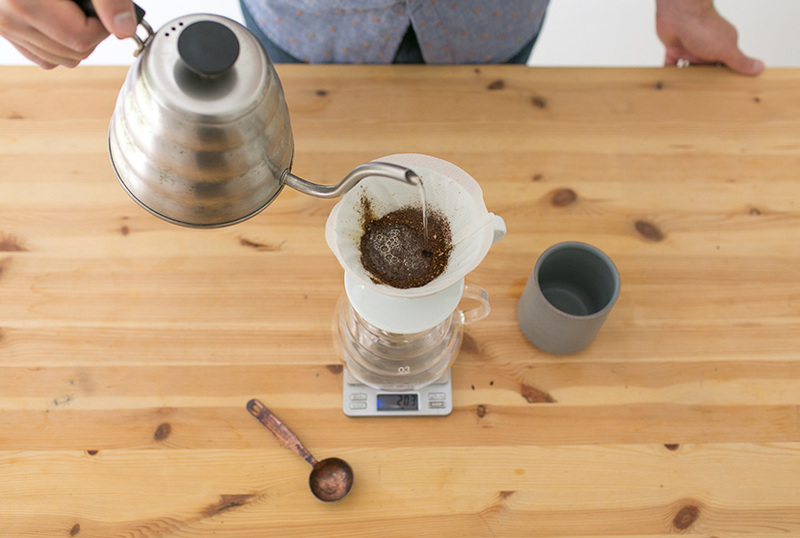 Most coffee nerds say this should be done in 4 minutes total. If it takes you any longer than 4 minutes your grind is too fine. That is it! 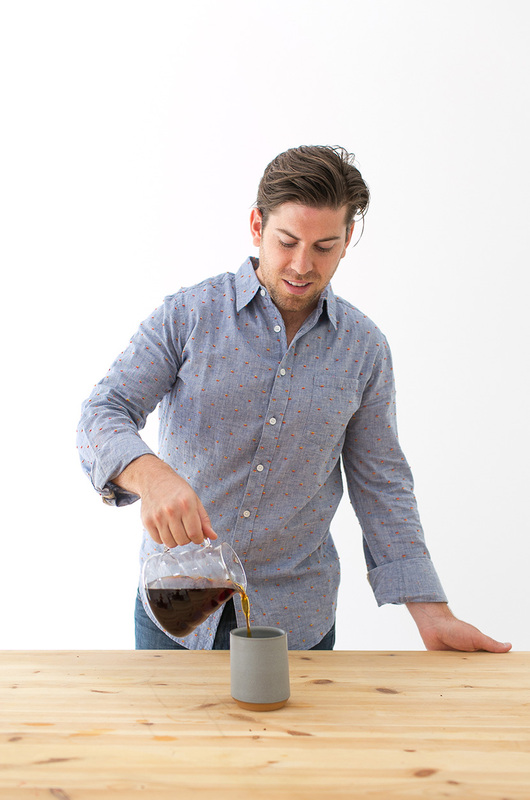 I hope this super simple guide will help you enjoy a better cup of coffee in the morning. 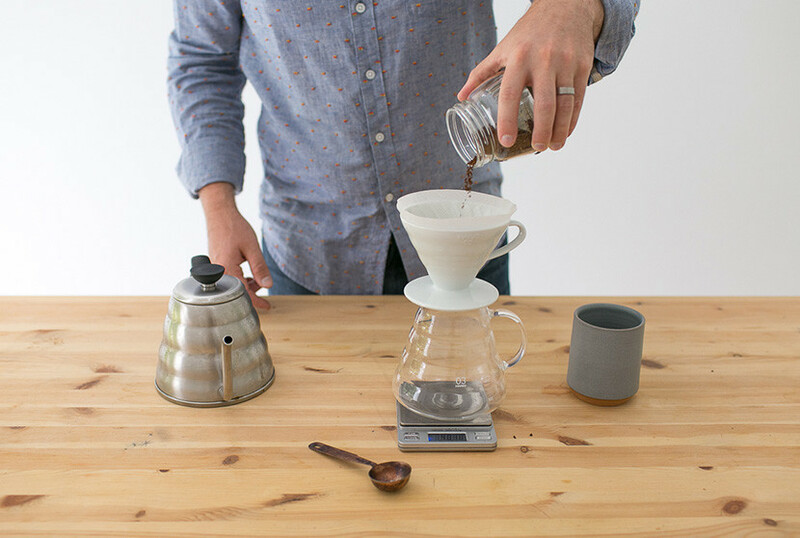 I know there are many ways to make a pour over cup of coffee, so please leave a comment if you have tried the V60 method or if you have another favorite method.